The Essaim demonstrator is a system of several micro-satellites (hence the name swarm' in French) for analysis of the electro-magnetic environment of the Earth's surface under development for the French Ministry of Defence's procurement agency DGA. The system, which is scheduled to be operational in 2004, also comprises a ground control segment and a ground station for data processing. It is called a demonstrator' as the mission's objective is to assess the operational capability of such a system, paving the way for the next generation. 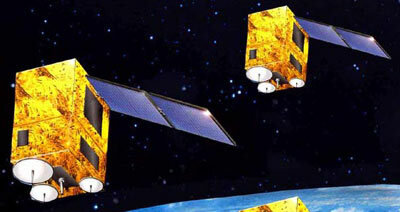 The Essaim satellites are based on the Myriade micro-satellite multipurpose product line developed jointly by Astrium and the French Space Agency CNES since 1998. In early 2000, the French Ministry of Defence (DGA) awarded Astrium the contract for the development, manufacturing of this turnkey system of micro-satellites and associated ground segment. Under the contract, Astrium is also responsible for launch services, personnel training and system operations during the three-year life duration of the programme.